Have you ever been playing well and then for some stupid reason you hit a terrible shot? A shot that is so bad that it rocks your confidence and makes you wonder where it came from? It happened to me on Sunday. I was playing well. I had just nailed a tee shot on the 10th hole and had a fairly easy approach to the green. For reasons I haven’t worked out (and never will) I hit an ugly pull hook with my eight iron that left me little or no chance for a par. I must say I was shocked by the shot and a little embarrassed. A few members had come out to watch the match and I don’t think they were impressed any more than I was. After chipping out I made bogey and lost the hole. The par three 11th is a short hole. As luck would have it I needed the 8 iron. I would be lying if I said the previous hole didn’t enter my mind. It did. In years gone by I’m sure I would have made many practice swings and tried to work out what had gone wrong. Then I would have tried to incorporate those thoughts into the next swing. This is something that never really worked for me and I believe is NOT something golfers should do. I accepted the shot as a bad one. I realise now that bad shots are part of the game. I have long since given up on the belief that I can hit every shot perfectly. This still doesn’t stop me from doing so – I’m just more realistic these days. This mind-set allows me to swing more freely and take the good with the bad. My secret weapon is to get my mind in the present and automate my golf swing. The benefit of doing this is my mind is not thinking about the last hole, the bad swing or what could possibly go wrong next while I’m executing the current shot. I’m in the now. For the small amount of time it takes me to hit the shot my mind is in a good place. I’m relaxed and have no self-doubt. I can worry and think about things after the shot is made! I focussed on what I wanted to do. I worked out how far I had to carry the ball to clear the front trap, I took into account the wind and hole location. I determined an 8 iron was the perfect club – it would clear the front bunker and finish below the hole on the hard and fast green. To help get my mind in the present I listen for outside noises, I remember listening to chatter in the distance, birds chirping in the trees and passing traffic in the distance. I’m now ready to hit the ball. I follow my automatic process – walk to the ball and then execute the shot. For that brief time I’m in the perfect place. My mind is calm and my confidence returns. There’s no self-doubt, concern or worry. My subconscious is doing what it does best – hitting the golf ball. This process allows me to bypass the negativity of a poor shot and all of the conscious chatter that golfers like to have. Most importantly it gives me a process to get my round back on track after hitting such a bad shot on the previous hole. In this case the shot as perfect – it landed safely on the green and I was able to win the hole. 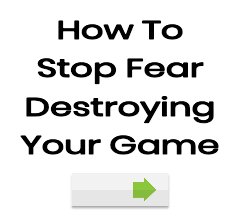 If you are continually let down by stuff ups and the odd bad shot or two then the automatic process can help. You will always hit bad shots – but you should be able to minimise the damage and not let them totally destroy your round completely. If you have any thoughts I’d like to hear from you. Thanks so much on the write up on what to do after a bad shot. When my round seems to be falling apart, a bad shot followed by a poor putt followed by a sliced drive I feel as if I am speeding up, I can almost feel a motor inside me starting to run faster and faster. The impact is a string of bad shots. Open to any ideas or thoughts on how to handle this. Thanks so much for this site and keep up the good work.